The idea that some form of advanced machining technique was utilized by the ancient Egyptians is one that has been circulating in the literature for well over ten years. I have presented the concept in my two books, The Land of Osiris (Adventures Unlimited Press, 2001) and From Light Into Darkness (Adventures Unlimited Press, 2005). The idea has been popularized and was presented to me in 1996 by engineer and master craftsman Christopher Dunn and detailed in his landmark book, The Giza Power Plant (Bear & Company, 1998). pounders and hammers. Dunn reported in his book, and continues to find, examples of multiple contoured angles, perfectly square corners and smoothly polished surfaces, and tolerances over 1/10,000 of an inch in the hardest stones known. In my first book, I presented the concept that a series of sites known today as Dahshur, Sakkara, Abusir and Abu Ghurob, Zayiet el Aryan, Giza and Abu Roash were once interconnected and known as Bu Wizzer—The Land Of Osiris—and all featured stone masonry pyramids and temples and were linked together as an ancient power grid constructed over 10,000 years ago. The ancient stone masonry pyramids were never originally designed and built to be tombs for kings, or anyone, but as energy devices that utilized flowing water and solar power from sunlight to produce varied forms of energy for the use of all people. These ancients whom we call Khemitians, not Egyptians, but who were indigenous ancient Africans, employed advanced forms of engineering and manufacturing to produce the artifacts in stone—and to cut, shape and lift the thousands of tons of stone that we see remnants of today. 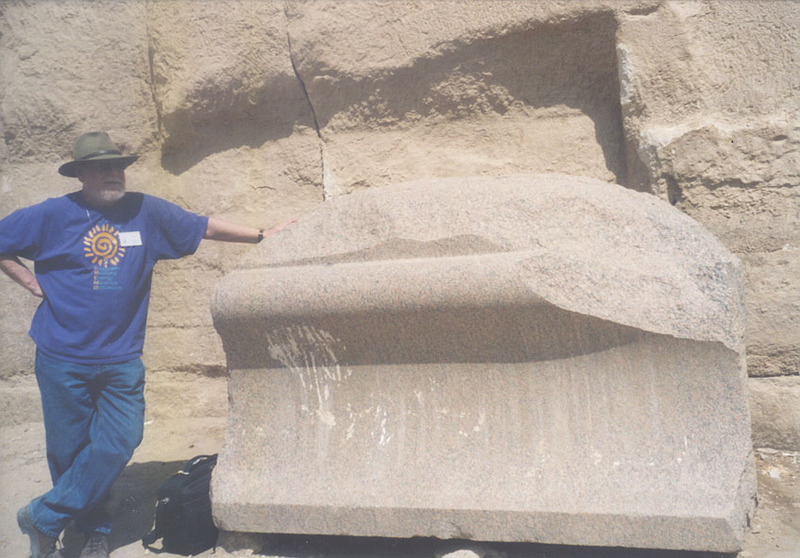 A recent tour and research trip that I led to Egypt in March 2007 enabled me to find even more evidence. The first example I usually show my groups, a genuine “smoking gun,” is to be found on the Giza Plateau right around the corner from the Sphinx (Fig. 1). This is a section of the huge granite ashlars that once covered the walls of the so-called “valley temple” in front of the Sphinx. This piece is made of rose quartz granite brought originally from Aswan , some 600 miles upriver from Giza , and features the multiple contoured angles and extreme precision and tolerances we discuss. We were able to find even more examples during this March tour. Two sites that I discuss in detail in my first book are that of Abusir and Abu Ghurob, located some two kilometers south of Giza . There is much to say about Abu Ghurob that is beyond the scope of this article. But my many and recent visits to this site only confirm my strong feeling that this is a very ancient occupation area, many thousands of years older than is recognized by Egyptologists and other academic archaeologists. Abu Ghurob, which literally means “Father of Crow’s Nests,” because of the great sight line from a small hill at the site, features many structures carved out of alabaster, a highly crystalline igneous (volcanic) rock. Many of these structures (Fig. 2) exhibit evidence of advanced machining. 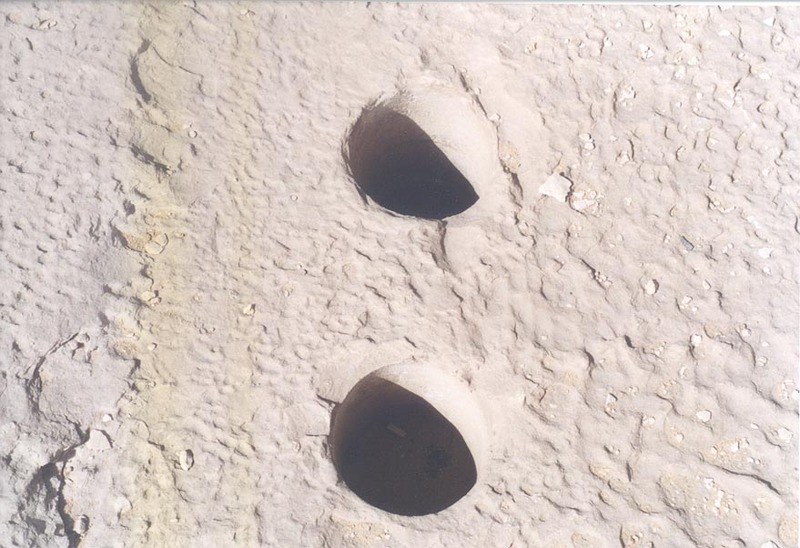 Perfectly round holes appear to be drilled right into and through the alabaster structures (Fig. 3 & 4). About a ½ mile east of Abut Ghurob is the connected site of Abusir. There are many amazing artifacts and partial structures still to be found here. I recently found an example of two ancient holes drilled into a basalt slab (Fig. 5). 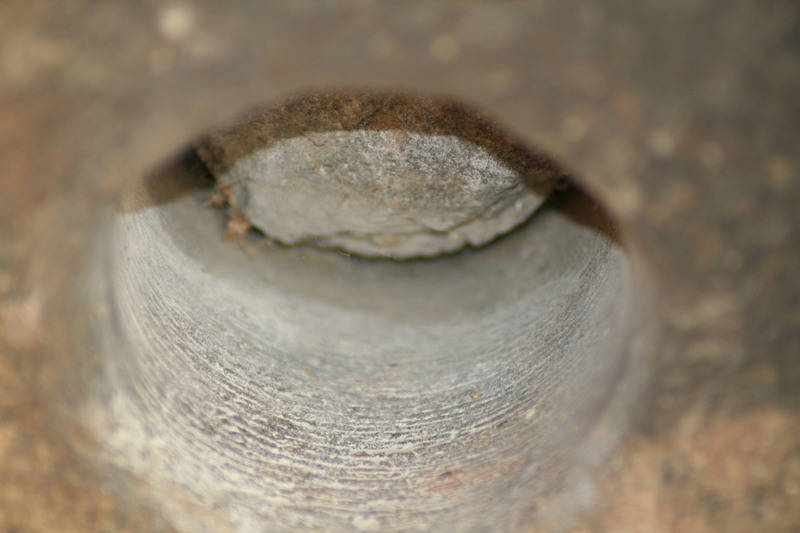 A close-up photo of the bottom hole (Fig. 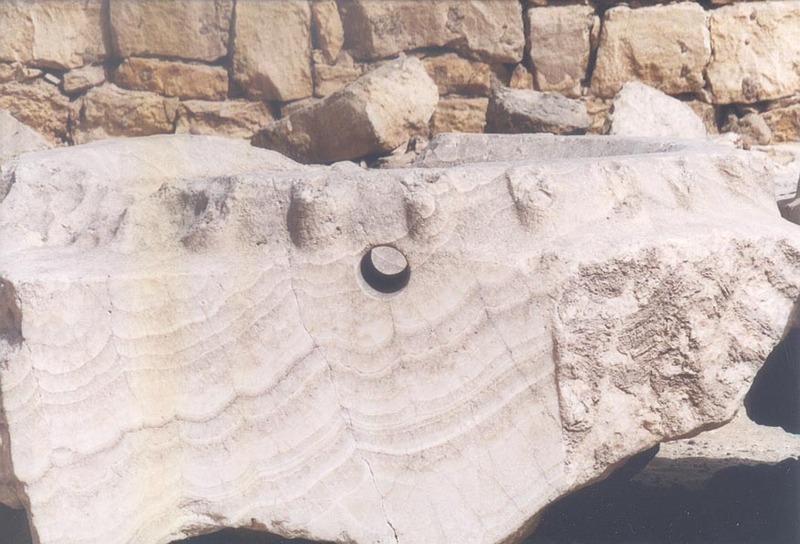 6) possibly shows spiral groove marks cut into the stone when it was drilled. I showed this photo to Chris Dunn and he responded by sending a close-up hi resolution photo of his own (Fig. 7). 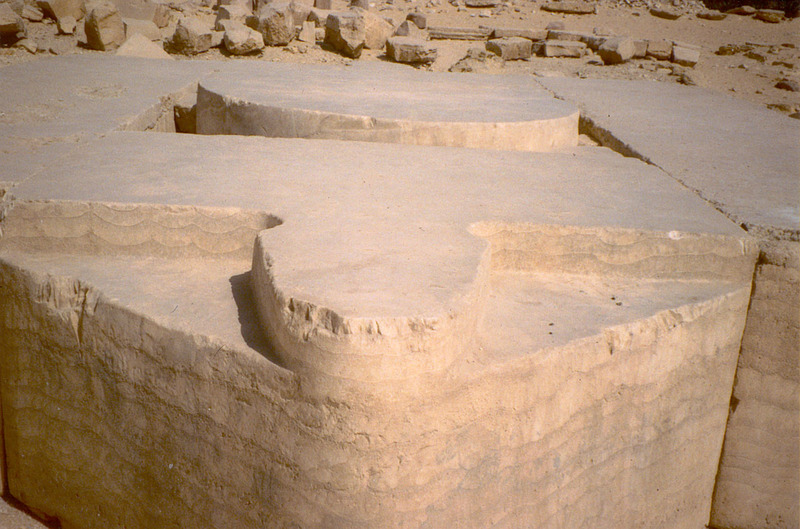 Dunn took this photo of a circular hole found in the granite of the “ Valley Temple ” of the Sphinx at Giza . In 1999, Dunn was able to go to the Petrie Museum in London . There he was able to find and study the drill core that Sir Flinders Petrie claimed came from this hole that he found in the 1880s. Dunn was able to discover, by threading the grooves on the core, that there was a single helix spiral groove around the core (known as UC 16306 in the Museum collection and core # 7 in one of Petrie’s books). 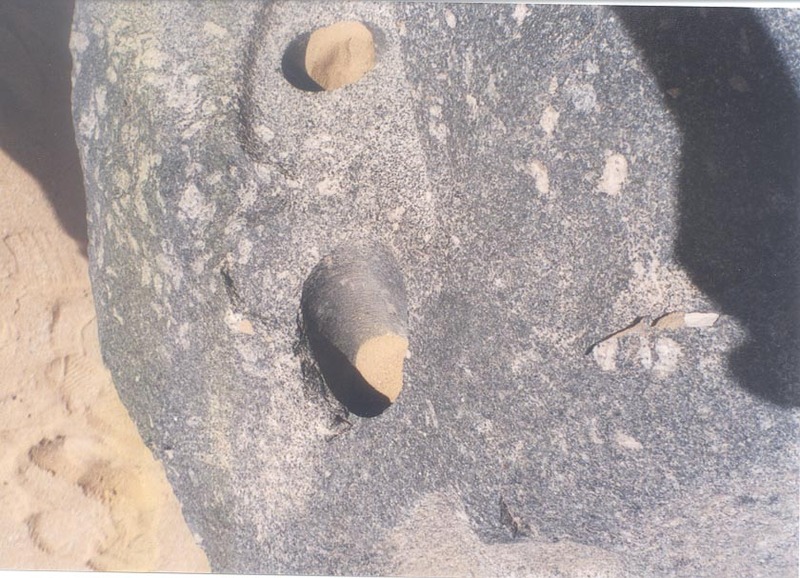 Being cautious and conservative by nature, Dunn would not state categorically that the photo of the hole in basalt at Abusir I sent him was “proof” of spiral groove marks from drilling—without the core itself to test—but was itself highly suggestive of being the same method and technique utilized in the production of the Petrie core and the hole drilled in the granite at Giza. 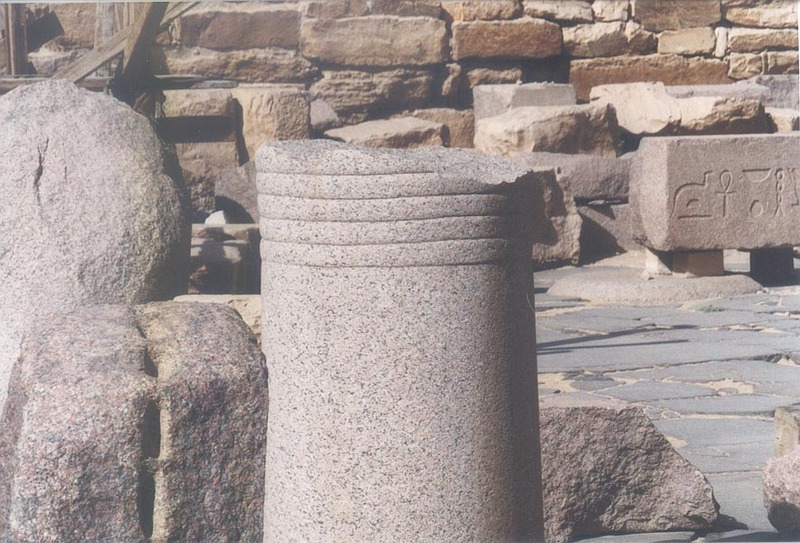 Another piece of evidence at Abusir was the remnant of a granite pillar (Fig. 8), with smooth rounded sides and no evidence of writing on it. We maintain that the inscriptions found on some of these structures were added on thousands of years after initial carving and construction that occurred over 10,000 years ago. 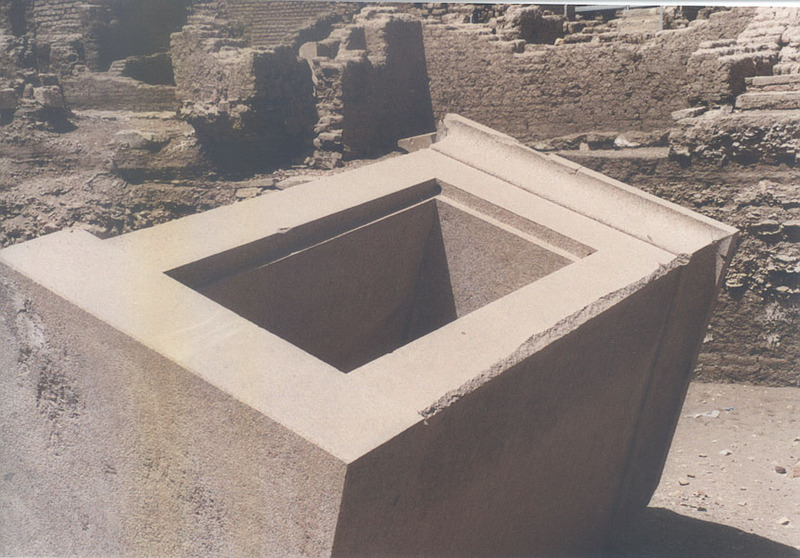 Other evidence we have studied over the years include the famous stone box found in the King’s Chamber (sic) of the Great Pyramid. Erroneously labeled as a “sarcophagus,” although no body or evidence of burial has ever been found in the chamber, the box is made of Aswan rose quartz granite and features perfect right angles and highly polished smooth sides (Fig. 9). The box has been studied by many scientists and researchers from Flinders Petrie in the 1880s to Christopher Dunn in the 1980s and 90s—with most all agreeing that the box was cut precisely with a large saw probably utilizing diamond bits. On the island of Elephantine in Aswan , in the south of Egypt , are to be found many more examples of apparent advanced machined artifacts. A large granite shrine, cut from one single piece of granite, is to be found, curiously, lying in its side (Fig. 10). The shrine features superb carving in the hard stone, with multiple precise angles and extreme tolerances. At the site of Sakkara, some 10 kilometers south of Giza , are also to be found many examples of advanced work in stone. Near the so-called Pyramid of Wenis, incorrectly labeled Unas by Egyptologists, can be found remnants of superbly carved granite pillars (Fig. 11)—again with perfectly rounded smooth sides and sharply cut angles. As we continue to gather and direct an interdisciplinary and holistic research effort in this area, with varied engineers, physicists, chemists, geologists, and archaeologists not bound by the outdated and incorrect paradigms of academic Egyptology, we will be able to present all this evidence that an advanced indigenous civilization once existed where Egypt is today—a culture capable of cutting, shaping, lifting and placing in precise geometrical arrangement, the hardest of stone found on our planet, utilizing highly sophisticated and technically superior methods and procedures. I urge anyone interested in this line of research to come to Egypt with me and observe the evidence firsthand for themselves. Fig. 2—Abu Ghurob. Altar carved from alabaster. Photo by author. 1997. Fig. 3—Abu Ghurob. Alabaster “basin” with round hole drilled through stone. Photo by author. 2007. Fig. 4—Abu Ghurob. Two holes drilled into alabaster stone. Photo by author. 2007. Fig. 5—Abusir. Two holes drilled into basalt stone. Photo by author. 2007. Fig. 6—Abusir. Close-up of drill hole in basalt with possible spiral grooves. Photo by author. 2007. Fig. 7— Giza . 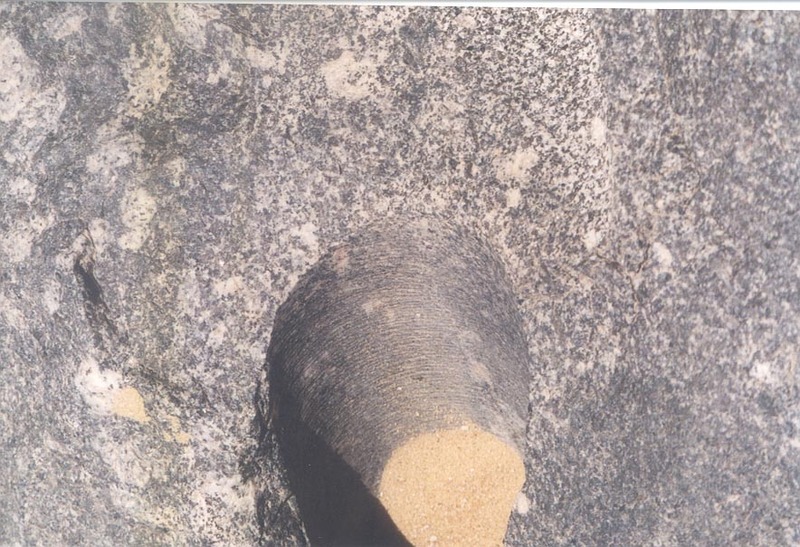 Close-up of drill hole in granite with spiral grooves. Photo by Chris Dunn.2007. Fig. 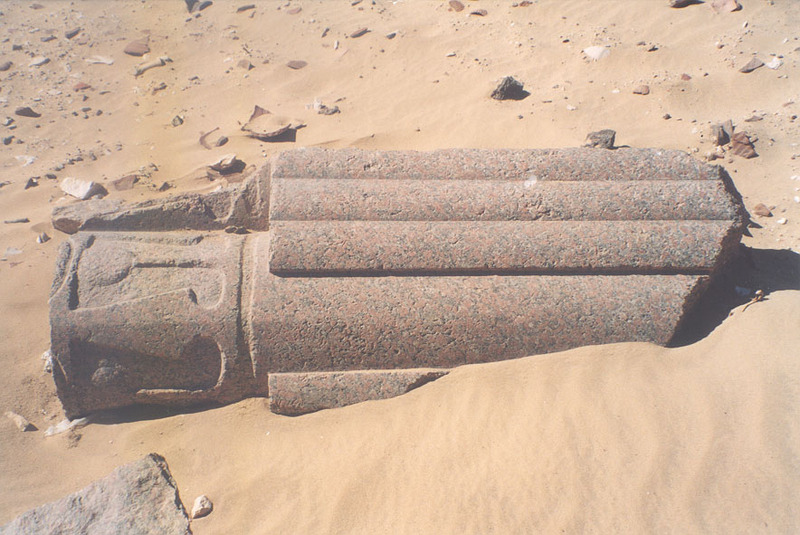 8—Abusir, Remnant of granite pillar. Photo by author. 2007. Fig. 9— Giza . 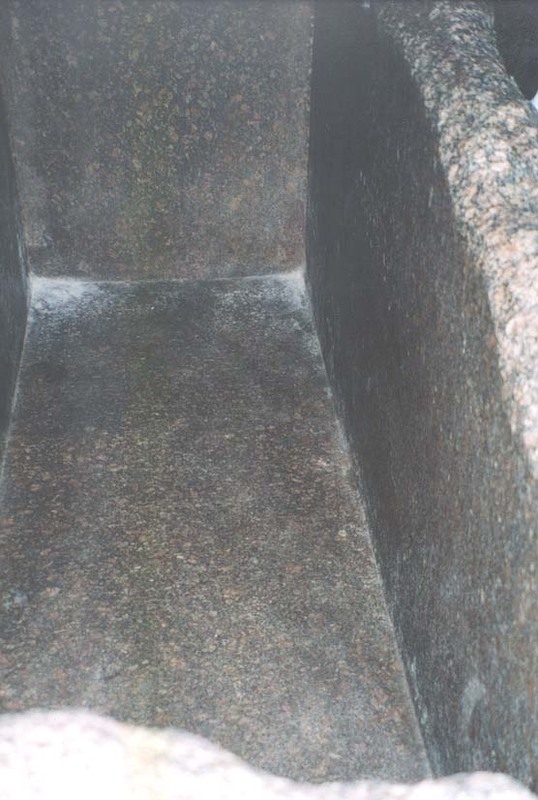 Granite box in Kings Chamber of Great Pyramid. Photo by author. 2006. Fig. 10— Aswan . Elephantine Island . Granite shrine. Photo by author. 2007. Fig. 11— Sakkara . Remnant of granite pillar. Photo by author. 2004.